Thank you to everyone that stopped by my Bloggy Giveaway for summer 2008. I hope to see many of you back here as regular readers to TheAngelForever. It was great meeting everyone that stopped by. I also surfed the Bloggy Carnival myself and entered a bunch of other giveaway. Congratulations to Shilo who said that she likes to eat ice cream in the summer. I have already contacted Shilo and she has replied so I can start to make her prizes. Since she has two little ones at home I am making each of them an M&M cloth in their favorite color. Looking back I have to thank some other people for giveaways that I have won from them. 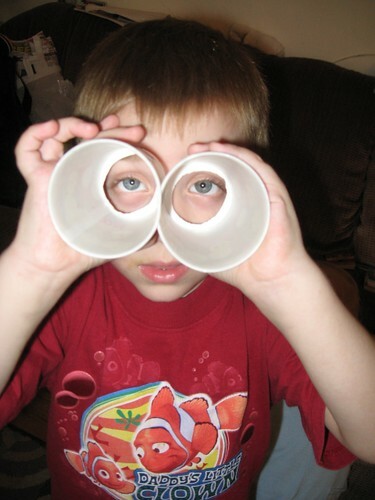 NHL decided to check out all of the things with his handy dandy binocular that he made at school the other day. First a thank you to Laura Williams for the great Tagasaurus that I won. Unfortunately, I am unable to get a photo of it right now because my son ran off with it and claimed it as his. I guess you can tell he really liked it! 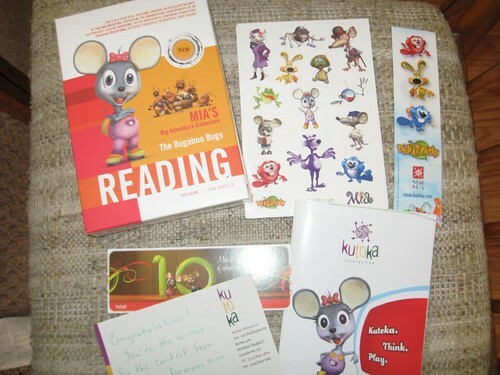 Thanks to the ladies at 5 Minutes for Mom and Kutoka for the fabulous Preschooler CD Roms to help my son with reading. We are going to try to set those up this weekend since they arrived late this week. We know he will have fun getting to know Mia. An additional thank you to the company for tucking in a note reminding me where the prize was from so I can give credit. Sometimes with Mommy brain I can forget. Here is a look at the goodies that arrived Wednesday. 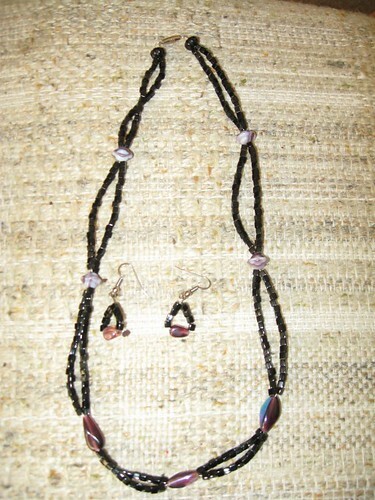 Handmade jewelry is such a special item and I was lucky to win a gorgeous necklace and earring set from killlashandra at Full Time in New Mexico. She had no clue that I love purple and below is her gorgeous creation that was made as a prize for her blog anniversary. 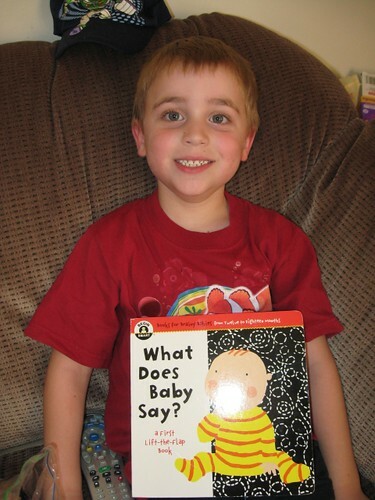 Last, but certainly not least I would like to thank Carrie at Reading to Know for the What Does Baby Say? book. My oldest son saw the package and immediately asked to open it. He quickly took the book to sit down and read. The little guy and I have started to look at it as well. He is fascinated with the easy to use flaps that are in the book. As a teacher I LOVE books and hope to share this passion with my boys. Here is NHL after he opened the book. Again thank you to everyone for all of the bloggy giveaway fun! Have a great weekend! That sounded like a lot of fun!